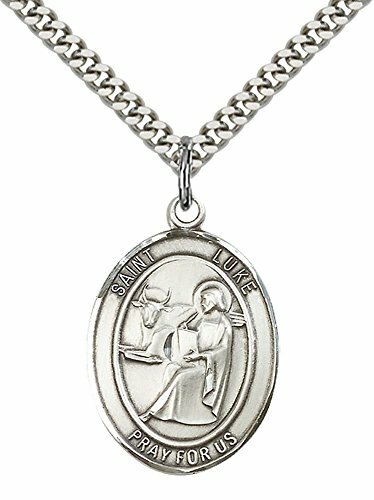 Sterling Silver St. Luke the Apostle Pendant with 24" Stainless Silver Heavy Curb Chain. Patron Saint of Physicians/Painters. Includes deluxe flip-top gift box. Medal/Pendant measures 1" x 3/4". If you have any questions about this product by F A Dumont Church Supplies, contact us by completing and submitting the form below. If you are looking for a specif part number, please include it with your message. F A Dumont Sterling Silver Crucifix Pendant with 24" Stainless Steel Heavy Curb Chain. F A Dumont Sterling Silver Miraculous Pendant with 24" Stainless Steel Heavy Curb Chain. F A Dumont Sterling Silver Miraculous Pendant with 18" Sterling Silver Lite Curb Chain.